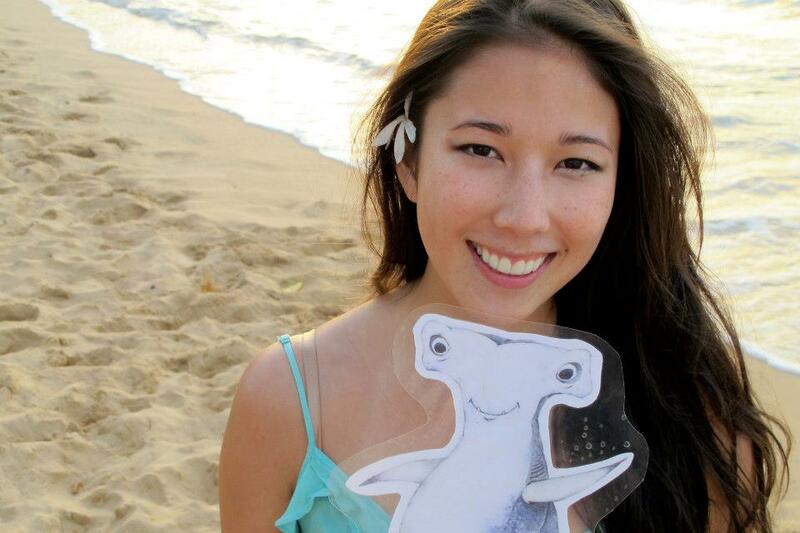 Take your photo with Shark Stanley and post it to Facebook, Twitter, and Instagram. We’re excited to announce the launch of Shark Stanley, a charismatic little hammerhead traveling the world to help protect sharks and rays! He’s the cornerstone of our grassroots campaign, a collaboration between two graduate students at the Yale School of Forestry and Environmental Studies, the Pew Environment Group, Shark Savers, and Shark Defenders. We aim to provide engaging and creative educational tools to mobilize youth support for shark conservation and ensure that our voices are heard on the international stage. Leah Meth and Shark Stanley. The idea is simple: cut him out, take a photo with him and send it our way! We’ll compile the photos across our social media platforms and make sure that key decision makers internationally see them. 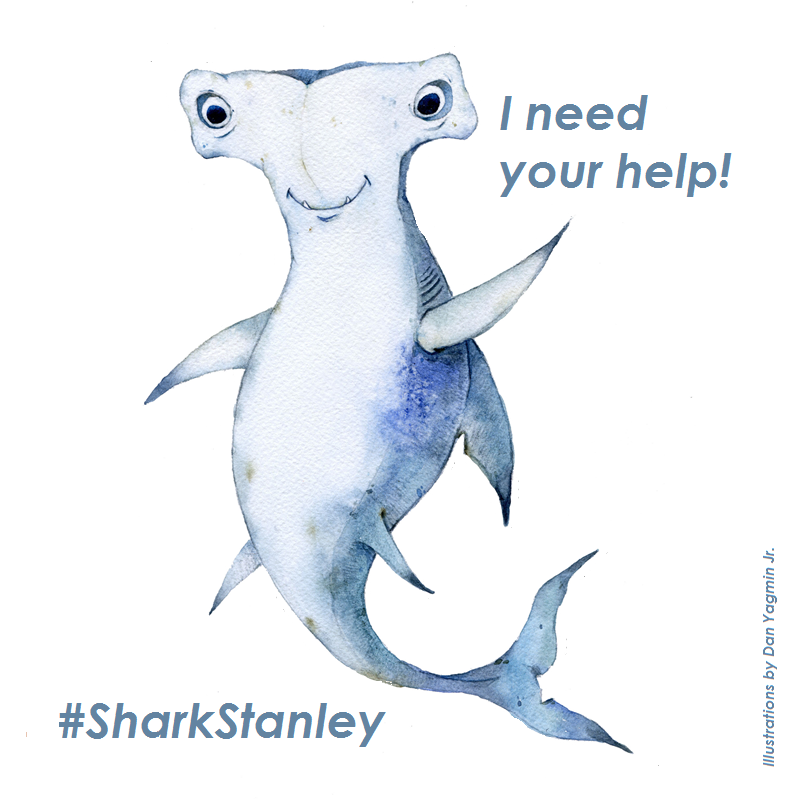 To accompany the cut-out, we will be releasing an educational children’s activity book in January, The Adventures of Shark Stanley and Friends, which will be available for free on Shark Defenders. Before we tell you more, we’d like to talk about why we’re doing this campaign, starting with the threats to sharks and why it’s such a critical time for shark conservation. In March 2013, the Convention on International Trade in Endangered Species of Wild Fauna (CITES) meeting will take place in Bangkok. With 176 member countries, this multilateral agreement protects more than 30,000 species globally and plays a powerful and key role in preventing extinction of many plants and animals by ensuring sustainable rates of trade. The Scalloped Hammerhead Shark, one of the most iconic and endangered shark species with some of the most valuable fins in the market. Listed as Endangered globally on the IUCN Red List, hammerheads often aggregate, making them even more vulnerable to overfishing. The Porbeagle Shark, a large, warm-blooded temperate water shark targeted for both its large fins and meat. Their populations have been reduced by around 70%. The Oceanic Whitetip Shark, an open ocean species with large, highly valued fins; Critically Endangered in parts of it range and Vulnerable globally. Oceanic and Reef Manta Rays, some of the most stunningly charismatic wildlife in the oceans. Listed as Vulnerable globally, they have been targeted in recent years for an emerging international market for their gill rakers, which they use to filter plankton. Some populations have declined by as much as 85%. At the CITES meeting in 2010, the passing of several shark proposals was only narrowly missed, needing only a small number of votes to pass. 2013 will be their year at CITES: the science is crystal clear, now we just need to do everything we can to make sure our country’s representatives vote YES! Ensuring shark and ray protection at CITES will be Shark Stanley’s first global campaign. As he and his friends prepare to head to Bangkok, we plan to have him reach every one of the 176 CITES member countries. Using viral social media, Shark Stanley photos will appear across all our platforms, from Facebook and Twitter, to Pinterest, Instagram and Tumblr. Our goal is to partner with 50 organizations, aquariums and NGOs internationally to gather at least 5000 photos from 176 countries, as well as photos from key celebrities and big names in marine conservation. Stayed tuned: we’ll feature our favorites across our social media platforms and will be offering give-aways and prizes over the next two months! Onon Bayasgalan and some of our supporters with Shark Stanley. These photos will provide a way for you to actively engage in shark conservation. Acting as “signatures,” they will be part of a creative petition that will diverge from traditional approaches. The internet has plenty of shark petitions, so our goal is to create something new to complement other campaigns by providing an educational tool that will go beyond a signature, providing a charismatic character that young people (and the young at heart) can build their own relationship with while making meaningful links with youth around the world as they share their own Shark Stanley adventures. Shark Stanley’s new friends will compile photos according to country in compelling visual mosaics, which we will send to all 176 representatives and display at the CITES meeting. We will show the people in charge of voting for these proposals that there are thousands of passionate supporters, in their country and globally, that demand shark protection! We invite you to join us to Help Protect Shark Stanley! Everyone can help with this! You can start by sending us your Shark Stanley photo. Downloads and simple instructions are here. If your organization would like to partner with Shark Stanley at CITES, put a link to this page on your website, then email us your logo and five photos of your friends with Shark Stanley to info@sharkdefenders.com. We'll post your logo and link to your website on a special sponsors' page. If you work with kids in schools, aquariums, museums (wherever! ), we’d love to provide our activity booklet for free or help you to design a workshop on shark conservation. Leah Meth and Onon Bayasgalan are masters student at the Yale School of Forestry and Environmental Studies and Contributing Editors at Shark Defenders.